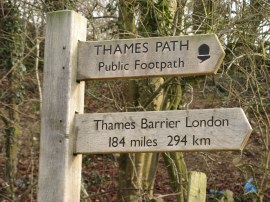 Having been planning this walk for several months the time had finally arrived to start my walk along the Thames Path. When I had mentioned last year that this was going to be my main walk for 2011 Sara had expressed an interest in walking the path with me and thus a fairly bright early Spring morning found us both at Coates ready to walk down to the nearby source of the Thames. Having Sara walking with me, as well as providing much appreciated and pleasant company, is also a great help in enabling us to do the walk as a series of linear walks rather than a number of circulars which is how I would had to have done the early stages if waking on my own till transport links become more frequent further down the river. From our B&B in Cirencester we had driven over to Cricklade before taking one of the cars over to Coates where we were able to park on the grass verge beside the Trewsbury Road. From our parking spot we joined a footpath that headed down hill along a field edge path, photo 1, towards the bottom of a shallow valley where we crossed over the now overgrown course of the Thames and Severn Canal, photo 2. From here it was just a short walk further along the footpath, with fields to the right and a small patch of woodland to the left, till we reached the small stone that marks the official source of the Thames, photo 3. Besides the stone was also a fingerpost stating it was 184 miles to the Thames Flood Barrier, photo 4, a setting far removed from where we currently were which I had visited only a few weeks earlier when walking the Green Chain Walk. 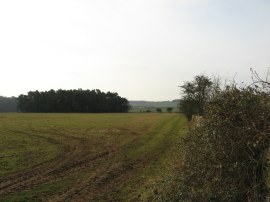 After taking a number of photos to mark the proper start of our walk we set off following the Thames path as it headed over a number of grassy fields towards A433 road which runs along the course of the old Roman Fosse Way. There was no water present on the first part of the walk, apart from a leaking pipe feeding a water trough, photo 7. 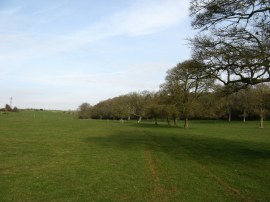 Once over the road the route heads diagonally across a field and then follows the right hand edge of the next field. Crossing a track into a third field we only had to walk a short distance further before we spotted a sizeable amount of water running in a channel on the left hand edge of the field, photo 8. We were unable to reach the exact point of the spring feeding the stream but we were now walking alongside the waters of the Thames itself. We then followed the stream down the grass covered field to the A429, photo 9, before heading across the road and joining a field edge path running alongside the left hand bank of the stream. 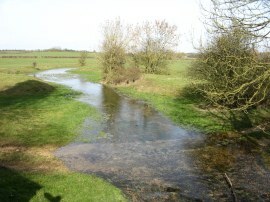 The water of the infant river were crystal clear, running over a gravel bed reminiscent of a chalk stream. 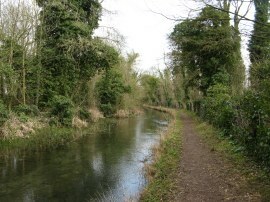 The field edge path is followed down to a road at Parkers Bridge where the route heads to the left along a track running parallel to the road alongside the river. Approaching the outskirts of Ewen the route briefly leaves the river and joins the road as it makes its way through the village. Despite a bit of a breeze the weather was feeling quite mild in the sunshine and we stopped by a handy bench placed by the local WI for walkers where I removed my fleece. 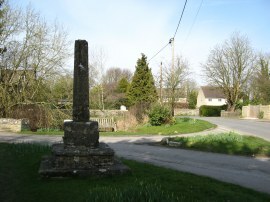 The route heads through the village before turning to the right down a road, photo 10. 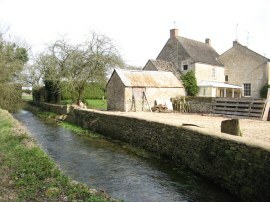 This is followed round back to the river to join a footpath on the left that once again runs alongside the river as it winds its way past a fine looking house and out across farmland. 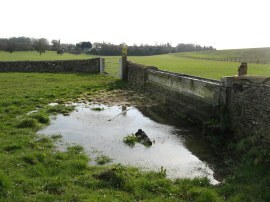 Shortly after the leaving the village the path heads past a gauging station, photo 11, before heading alongside a number of fields to reach Upper Mill Farm, photo 12, where the water was rushing down a side channel to the right of the path. Just below the mill the path crosses a wooden footbridge over the river a little further on the route skirts round the edge of a field with a rusting metal wind pump in the middle before passing Old Mill Farm and a few fields further on Kemble Mill. Heading along the edge of one more large field, photo 13, the route enters into Neigh Bridge Country Park, the route heading to the left along the edge of a large pond, photo 14, to eventually reach a car park which the path heads past to join Spine Road. This had been quite a long stretch of walking alongside fields although the time had gone by very quickly, a sure sign that I was enjoying the walk. 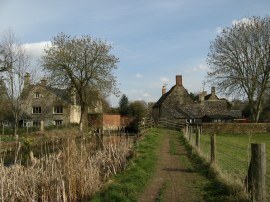 Turning to the left, the route heads along the road for a short distance before joining a road on the right that leads towards the Lower Mill Estate. 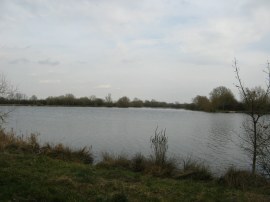 A short distance down this road the footpath runs alongside Mill Lake, photo 15, the first of a large number of lakes that the course of the Thames runs through for the next few miles. 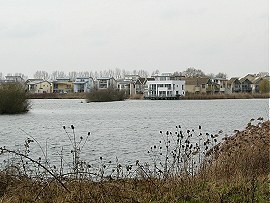 Collectively these lakes are now known as the Cotswolds Water Park and were formed by old gravel extraction works. 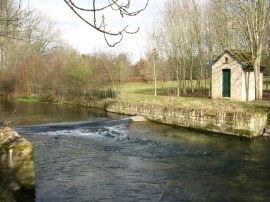 After passing by the building of the Lower Mill Estate, photo 16, the route heads along a very pleasant stretch of footpath alongside the river, sometimes running between trees, at other times over more open ground with the large lakes on either side of the path. There were a large number of birds in amongst the bushes besides the path, most of which never sat still for long enough to identify although I did manage to get a rather blurry photo of a Reed Warbler. Just before Freeth's Wood the route crosses the county boundary from Gloucestershire into Wiltshire, making this the first time I have done any walking in Wiltshire. Reaching the B4696 road the route continues straight ahead along a footpath that leads to Ashton Keynes. 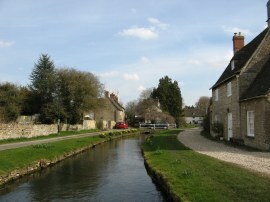 Here the footpath narrows to squeeze by another old mill building besides the river, photo 18, before joining Church Walk where we sat on a pleasantly sited bench for a short lunch break overlooking a channel of the river surrounded by pretty houses on either side, photo 19. The bench was in the sun and sheltered from the wind and it was perfectly warm enough to sit there in just my T shirt while I ate my sandwich. Having had a very pleasant break we headed on down Church Walk before turning to the left along the small High Street by a wayside cross, photo 20, which is now classed as a grade 2 listed building. A few yards further on the Thames Path heads to the right along Back Street before briefly turning into Kent End where we joined an enclosed footpath on the left. This ran down between fields to join a track running behind houses which soon leads to another road. 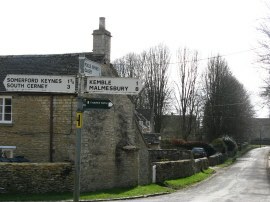 Crossing this road, the route heads across the village playing fields before once again joining a footpath that runs between old water filled gravel pits although at this point we were some distance away from the course of the river. 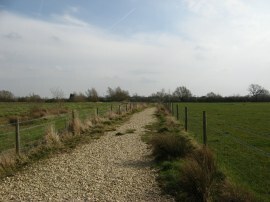 For a while the footpath was covered in gravel which was almost like walking on a shingle beach, photo 21. 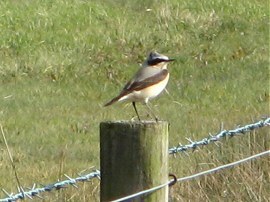 There were still large numbers of birds flying around and I managed to get a fairly decent photo of a Wheatear, photo 22. 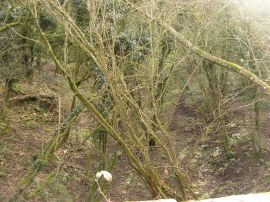 Once again the footpath headed through a mixture of tree, shrub and reed lined areas, photo 23, along with more open parts. 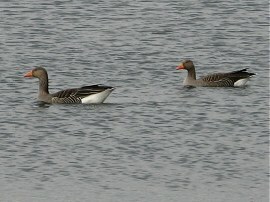 After spending quite some time on a section path bending round the edges of Manorbrook Lake, photo 24, we reached another lake where there were a number of Greylag Geese, photo 25. It was odd to think what is now such a tranquil place must once have been a center of industrial activity. 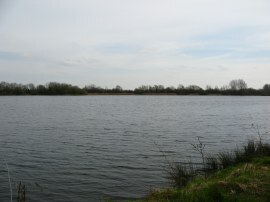 The path follows a broad track that heads round to the left by the edge of Cleveland Lake before reaching a gate where the route heads sharp right away from the lake. 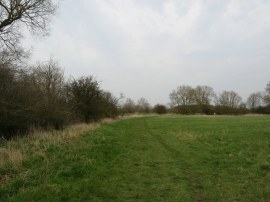 This stretch of path is followed up to another track where the well signed route heads to the left, following the track round three sides of a field before heading up to join the track bed of the railway line that used to run to Cricklade. 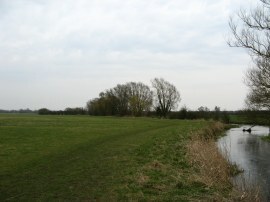 The Thames Path heads to the right along the course of the old railway until it reaches a bridge over the river where the route descends from the railway embankment to join a path, photo 26, once again running alongside the River Thames with meadows of the North Meadow National Nature Reserve to the left, photo 27. 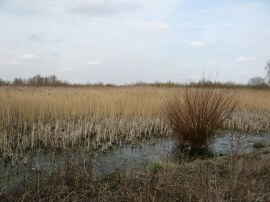 This meadow is well known for the Snake's Head Fritillary that flower there every Spring. While we were a bit too early to see the flowers but there were warning signs in place asking walkers to stick to the paths as the plants were starting to grow. 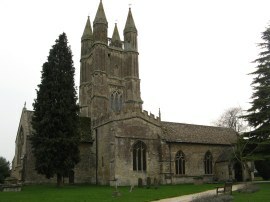 We were now beginning our approach to Cricklade and away to our right we could see the tall turreted tower of St Sampson's Church growing ever larger away to the right. Leaving North Meadow the route heads alongside a couple of small fields that had been set up with a variety of brightly painted horse jumps before passing a small weir. Soon the path crosses a footbridge over the river and crosses a small section of open ground to briefly join a road running behind houses in the outskirts of Cricklade. 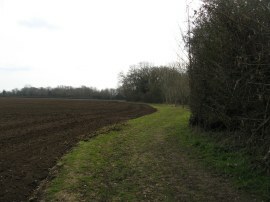 This track soon leads to out into a meadow which the footpath heads across to reach a road, North Wall. 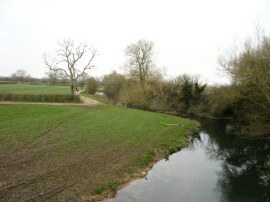 This is where we had parked our car in the morning however we had made really good time along the path, something to bear in mind when planning future stages of the walk, we decided to walk a little further along the path through Cricklade. 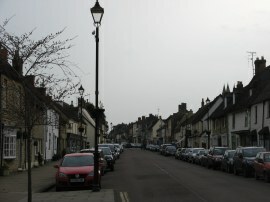 From North Wall the route heads to the right up Cricklade High Street, photo 28, only briefly visiting the town, before heading to the left along Abingdon Court Lane. Reaching the end of the road the route heads to the left along a driveway which is followed round to the right for a short distance before the path heads into a meadow once again running alongside the edge of the Thames. This is followed down to a broad bridge over a tributary of the river before the path follows the Thames round to the left to pass under the rather noisy A419 dual carriageway to reach a field where we finished our walk for the day, photo 29. 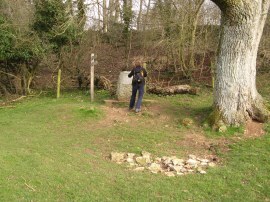 At this point we had walked 13.3 miles from the source of the river near Kemble. We then retraced our steps back under the road bridge before joining a path that led back into Cricklade. We then had a brief wander around the town, including a visit to St Sampson's church, photo 30, where we met Chloe the very friendly church cat, before heading back to our parking spot at North Wall having walked a total distance of 15.2 miles for the day. 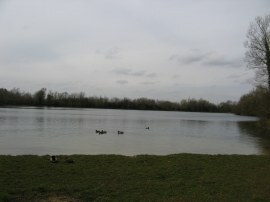 As usual I have uploaded the route of the walk which can be accessed here: Thames Path Stage 1 Route. 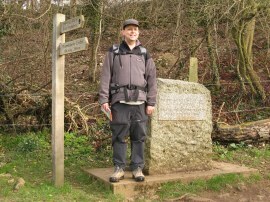 I was so happy to finally get this walk under way and pleased that we had such decent weather for a mid March day. The path itself was well signed and very easy to walk along meaning we made very good progress along the path. 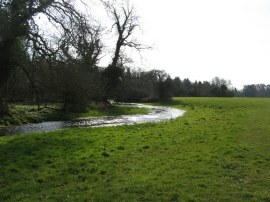 The countryside around the river did not disappoint and there was a decent flow of water in the river from before the Kemble Bridge; all in all a very pleasant days walking.